I wanted to let my readers know about a recent success story. I had a patient that came in with horrible sciatica, The Sciatic nerve is the largest nerve in the body and when it is pinched or when a disc is herniated the pain is horrible. So back to the patient, She lives and works in NYC and was searching for a Chiropractic in NYC. She happened upon my site and came in for a visit. She could barely stand upright and was in agony to the point of tears. 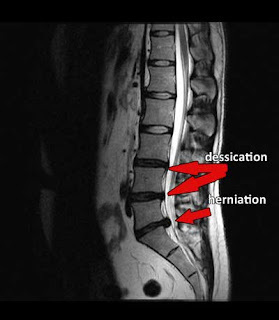 I did an exam and determined that she had a herniated disc and to confirm that I refereed her out for an MRI that showed a large disc herniation at L5 S1 putting pressure on the S1 nerve root. I also ordered a Nerve test to confirm nerve root involvement. I started her treatment with conservative Chiropractic care and Spinal decompression on the DRX 9000. After 2 weeks she is back in the gym and is virtually pain free. Today was the 15th visit on the DRX 9000 and she was so happy to be out of pain and back in the gym. I will refer her out for another MRI in about 3 months to confirm reduction of disc herniation, I will be sure to post those with the patients permission. These are the typical cases that I see. If you have Chronic back pain and live or work in NYC consider this treatment. Whats even more exciting is this treatment can be covered by most medical insurance. Call our office at (212) 645-8151 we can verify before you come in if your insurance company will help pay for this procedure.